The Doll Sweet Journal. : Thank you, Michigan! Tonight I like Michigan a lot. There are some very smart people there, and because of them my state of political depression can now come to an end, at least for the time being. Mitt Romney won the primary there tonight by a good margin, deservedly so, as well as necessarily so, otherwise I think it might have been the beginning of the end of his campaign for President. Even though he apparently has changed his policies more than the others (which is his biggest downfall in my opinion), he is by far the best person for the job. He's extremely intelligent and articulate, highly driven and motivated for the right reasons, he's proven that he gets difficult things done well, he got the bluest of blue Democrats of Massachusetts to vote for him, he's not a career politican, he's a true conservative, and he's a patriotic American. Plus he's a genuinely nice guy. I know this from personal experience. When I was in high school a decade ago (yikes!) he was the Boston Stake Young Men's President and so he was at many of the youth activites we had, serving us dinner, interacting with us, smiling and laughing, dancing alongside us with his wife at dances. A lot of people as busy as he was wouldn't have been at all of those things, but he so often was. I remember when Ann came to my ward one Sunday to visit because she was in the stake Young Women's Presidency. After church was over she walked down the hall with me and two of my friends and took the time to really talk with us before she left. I remember she looked me right in the eyes like she was actually interested in me. Not all adults do that with teenagers. And one of my Young Women advisors who is a family friend of ours was Romney's scheduler when he was Governor and she said he was a good boss who treated his staff well. 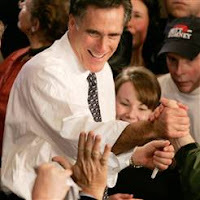 Anyway, victory in Michigan in no way means that Mitt's quest for the nomination is now easily within reach. He has a hard road ahead. I'm worried he won't do very well in the South Carolina primary this Saturday due to the anti-Mormon prejudice that is historically strong in the South. (My prediction: Huckabee will win it, of course!) But Romney does have more delegates and votes than the other candidates and hopefully will soon be able to emerge as the front-runner. It is such an interesting Republican race with so many contenders still around at this stage of the game, while the Democrats have been able to whittle it down to three, mostly two candidates. I'm glad that I can be more excited about the race again, but it is a cautious sense of optimism because you never know what will happen. And I'm worried that Mayor Bloomberg is going to throw a wrench into the whole thing by deciding to run, which would make it even more difficult for Romney and the rest of the Republicans, while being a gift to the Democrats. The next few weeks leading up to Super Tuesday on February 5th will be very interesting. And hopefully not depressing!